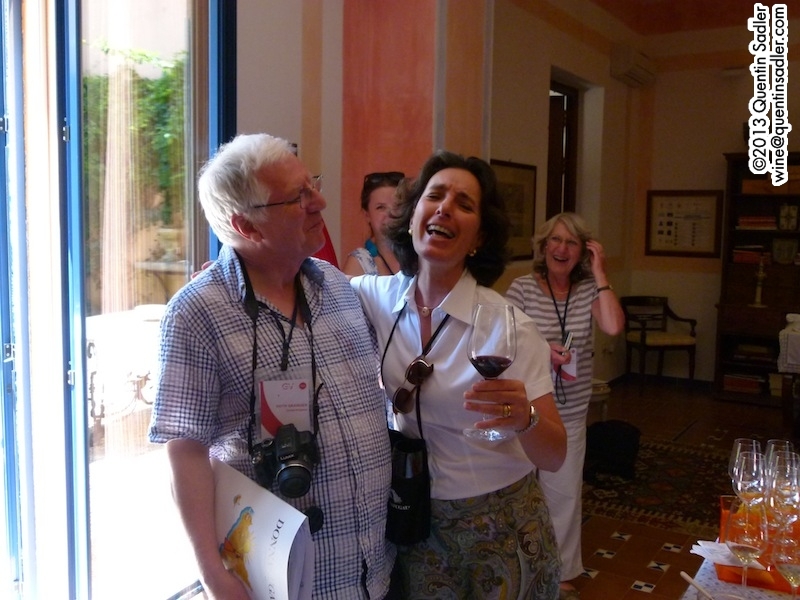 Hope fully you enjoyed my piece about Sicilian food and your appetite was suitably whetted to hear some more about the wines from this wonderful island. 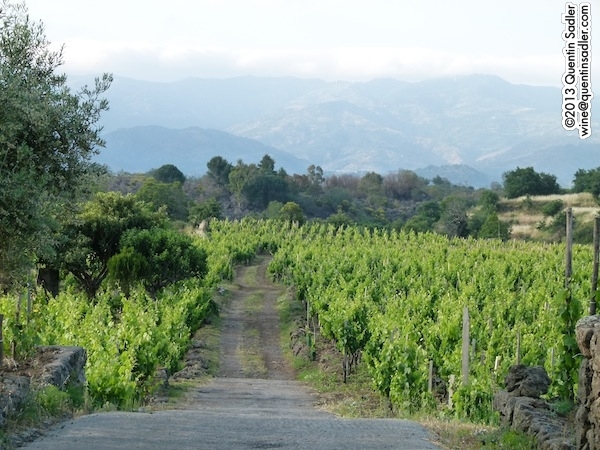 I wrote about Donnafugata, one of the leading Sicilian estates here, but this article focuses on one of the leading quality wine regions on the island – Etna. 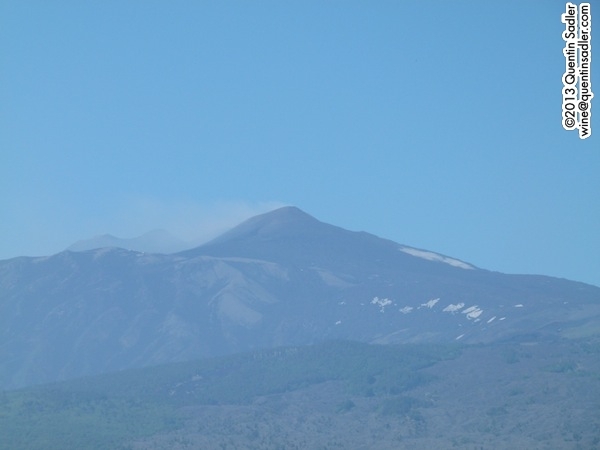 Views of Etna dominate the landscape. The first couple of days of my Sicily trip were spent around Etna and although this wine region is a mere D.O.C. – rather strangely the only D.O.C.g. on Sicily is Cerasuolo di Vittoria. I found Etna to be the most consistently high quality region that I experienced on Sicily. Other areas have some great producers making very good wines, but to me Etna appeared to be Sicily’s most consistently reliable region for making good and interesting wines. The natural conditions seem to lean towards excellence and excitement whereas perhaps the other places need to work that bit harder for really exciting wines? 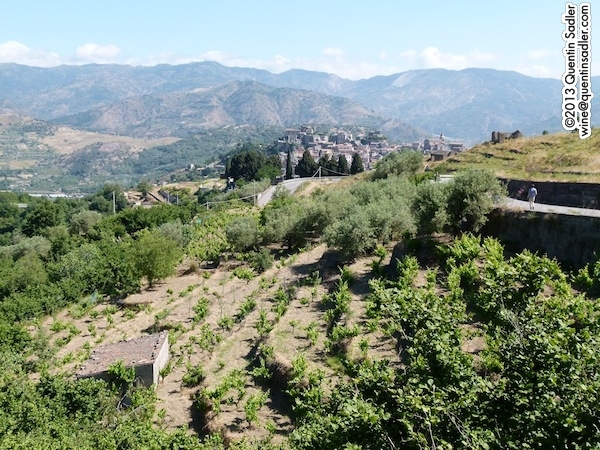 Of course the fact that it is Sicily’s smallest region might help keep the quality up too as it means that by and large Etna is a land of boutique producers and small estates. Wine map of Sicily – click for a larger view – non watermarked PDF versions are available by agreement. Etna is an amazing area and although wine is produced all over the volcano’s lower slopes and surrounding hillsides, the D.O.C. only covers the northern, eastern and southern slopes – see my map. This can mean that some very good Etna wines only have I.G.P. on the label, as does the fact that the D.O.C. does not cover the very highest slopes – yet. 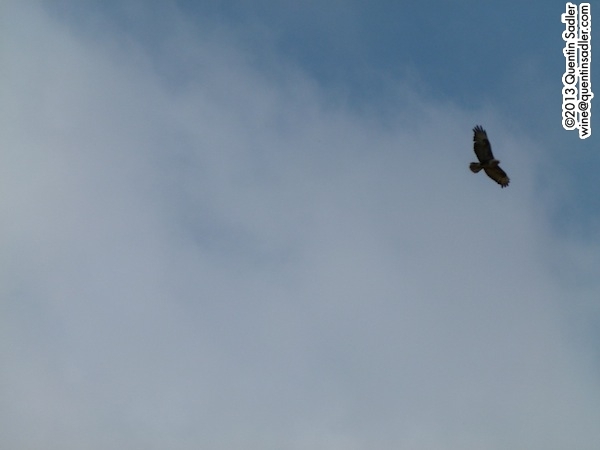 The soil is a fine volcanic dust – see the bird in the sky, look 2 photos down. That bird again, as close as I could get it, it looks like an eagle to me. Anyone know what it is? Altitude varies enormously here from 450m to 1100m above sea level and the eastern slopes enjoy much more rain than the other sides. 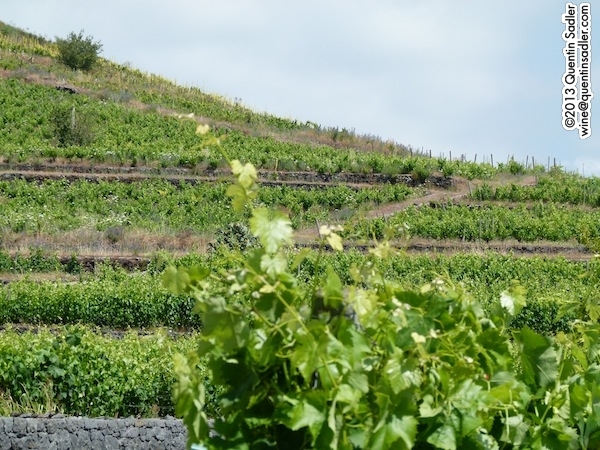 This tempers the heat and dry conditions, so together with the height making it cooler and the rich mineral, volcanic soils this area is really good for white wine production. Certainly three of my favourite whites from the trip were grown around the village of Milo on the south eastern slopes of Mount Etna – if your Etna Bianco is labelled Superiore then it can only come from Milo. I really liked a great many wines from around here, but the whites led the pack for me – perhaps because they suited the cuisine so perfectly, but possibly because they were really very good. The secret weapon of the area is their own indigenous white grape called Carricante. It does not seem to be grown anywhere else, but it responds superbly to the local conditions to produce elegant dry white wines with high acidity and wonderful minerality – so can put the drinker in mind of Assyrtiko from Santorini. The beautiful Tenuta di Fessina, the site of an ancient lava flow, blocks of volcanic stone are used to build the retaining walls. Diletta Lavoratorin, our animated and informative host. Like most of our Sicilian hosts she hardly ever stayed still enough for me to get a decent photo! I did wonder about a caption competition for this, so feel free to send ideas in! This beautiful estate is the brainchild of Tuscan wine producer Silvia Maestrelli and Piemontese Federico Curtaz and is just 10 hectares pieced together by buying up old bush vine vineyards. 100% Carricante from 45 year old vines grown in Santa Maria di Licodia at the southern tip of the Etna park and on a southern exposure at around 900 metres and although I loved all the wines here, this was my favourite and the one that I actually bought. Unusually this was seemingly fermented and then aged for 6 months in large French oak barrels, these varied between 1 and 15 years old – leaning towards older and so neutral in taste – but oak does not dominate this wine at all, or detract from the minerality, acidity or tension, or not yet anyway. Perhaps the oak will shine through in a few years time, but I would rather have it now with a pristine, mineral feel to it. Right now though it is taut, lean, stony and mineral with a thrilling citrus cut of high acidity to the palate and a touch of saltiness too. There is real richness to the palate as well which gives that lovely feeling of tension to the wine. I really really liked this and it went wonderfully with a superb dinner at the winery, the arancini were especially good – 91/100 points. Tenuta di Fessina wines are available in the UK from Outis. Tenuta di Fessina wines are available in the US through Winebow. Benanti’s Sera de la Contessa vineyard. I was greatly looking forward to visiting Benanti. I had tried a couple of their wines before and knew they were good, so eagerly anticipated trying them in situ and learning about this impressive producer. Technically it was established in 1988 by Giuseppe Benanti, but actually his family had farmed this land for generations and what he did was to really focus it on wine production. Not just any old wine either, right from the start he wanted to produce fine wine. As recently as 1988 no one else was trying to make top quality wine on Etna, so Benanti was the trend setter. He saw the potential in his land and sought outside advice from experts in Burgundy and Piemonte on what to grow and what to do he set off trying to turn Etna into a great wine region. Antonio Benanti – the only photo I have of either of them even vaguely in focus as they would not keep still, even when posing for pictures! Today the place is run by Giuseppe’s twin sons Antonio and Salvino and they really do seem to do a wonderful job. They exude charm and confidence and a real love for their land, although they have both had other careers before joining the family firm. What fascinated me was their belief that Etna is totally unlike the rest of Sicily, they claimed to never even talk about Sicily, just Etna. They regard their wines as mountain wines, Alpine like Austrian or Friulian wines rather than Sicilian Mediterranean wines. I can see what they mean too, their wines – the whites anyway – have a purity about them that seems very unlike the Mediterranean. Although the history of Benanti wines is not long they have come a long way since 1988 and now exclusively champion the native grapes of Etna over the international varieties they started with. For me this is the standard bearer wine for Sicily – or Etna anyway. Pure Carricante grown in Milo at over 950 metres above sea level, most of the vines are over 80 years old and many are ungrafted. The wine is unoaked, but released after ageing in bottle, 2009 is the new release. This age means that we still get the taut, nervy minerality and high acidity, but it is balanced by some creamy waxy richness that makes the whole wine more complex and interesting and introduces richer orange notes and nuts in to the flavour profile. This is a wonderful wine – 93/100 points. Castiglione di Sicilia where Rovittello’s grapes are grown. 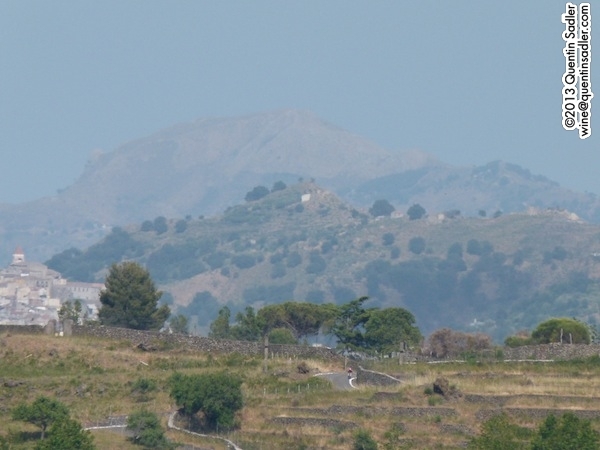 Castiglione di Sicilia from afar with vineyards in the foreground. 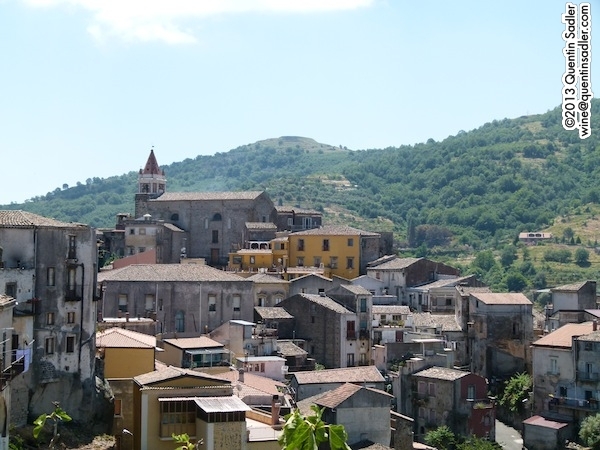 The hillsides around Castiglione di Sicilia. 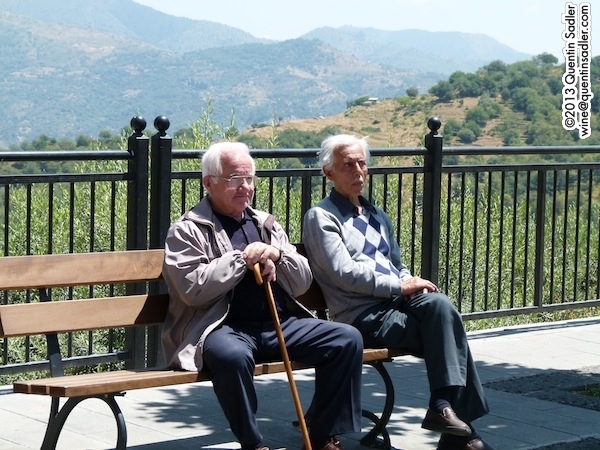 Elders of Castiglione di Sicilia. 80% Nerello Mascalese – the dominant black grape in these parts – and 20% Nerello Capuccio. Masacali is a village on Etna which lends its name to the Nerello Mascalese. This wine is made from a 80 year old vines on a single vineyard site in Castiglione di Sicilia at 750 metres above sea level and aged in cask for 12 months. This is a delicious red wine, rich with black cherry characters and iron-like minerality, silky tannins and earthy, mushroomy, leathery, tobacco together with dried fruit and gently rustic and baked Medierranean flavours. The finish is very long and with a wonderful savoury character – 90/100 points. 100% Nerello Capuccio, also from Castiglione di Sicilia, grown at 700 metres above sea level and aged in cask for 8-10 months. This is simply an I.G.T. as the D.O.C. rules only allow up to 20% Nerello Cappuccio in Etna reds. This is because it is not so widely grown and is very much the junior partner historically. I did like the Rovittello very much, but this really stood out, everything about this wine is a delight. The colour is intense, the nose is lifted and aromatic with rich red fruit and savoury leather and herbs. On the palate there’s a supple, mouthfilling and velvety texture with soft tannins and intense sweet red fruit, ever so slightly cooked and reminiscent of rich Pinot Noir, especially as there is some freshness of acidity. There are herbs, iron, earth, rich cherry, salami, tobacco and mocha, some of which implies a sort of rustic memory somewhere in this wine’s DNA, but it isn’t rustic at all. A glorious wine – 93/100 points. I should also point out that the 2006 Il Monovitigno Nerello Mascalese is rather lovely too, but the Cappuccio totally thrilled me that bit more. Benanti wines are available in the UK from Les Caves De Pyrene. Tenuta di Fessina wines are available in the US through Wine Warehouse in California. 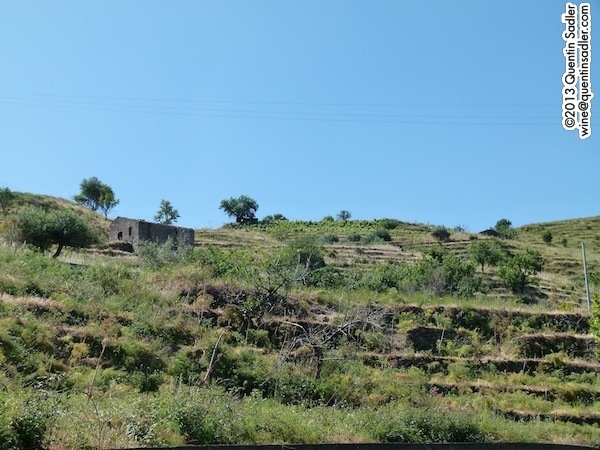 Another family winery that is seeking to make great Etna wines in the Castiglione di Sicilia area, Cottanera was created in the 1990s by brothers Guglielmo and Enzo Cambria when they converted a hazelnut grove into a vineyard. Since Guglielmo untimely death the estate has been run by his daughter Mariangela and Enzo. The fresher, zestier side of Etna Bianco This is basically a cold fermented Carricante – with a little dollop of Catarratto – that was aged on the lees. The nose was restrained, tight and mineral with just a touch of lemon, lemon rind and smoky lees. The palate is deceptively rich with zesty lemon rind acidity and some weight of smoky creamy lees in the mouth. It is almost crisp and has pretty high acidity too and is very clean with a feeling of purity and lively with pear and grapefruit on the long finish. A lovely dry wine – 89/100 points. I also highly rated (90 points) their seductive 2005 Etnarosso which is 90% Nerello Mascalese with 10% Nerello Cappuccio aged for 9 months in a mixture of large wooden vats, new and older barrels. 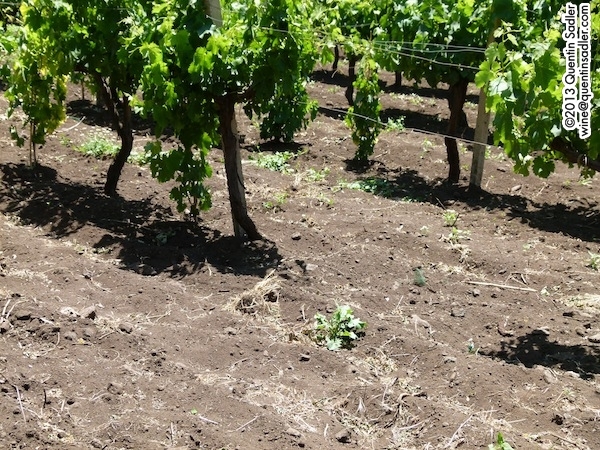 As I say Etna seemed to me to be the finest and most cohesive of Sicily’s wine regions. I had lovely wines elsewhere, but they seemed more dependent on being made by a good producer, whereas all the Etna wines I have tried have been very good indeed – especially the whites. In fact after I arrived back in the UK I tried the Wine Society’s bargain 2012 Etna Bianco from a producer called Nicosia and while it was not in the same league as the other whites mentioned in this piece, it was a lovely, fresh, crisp, mineral and tasty dry white wine of real quality at just £8.50. I also tasted one more Etna white on the trip when I visited Planeta a few days later. 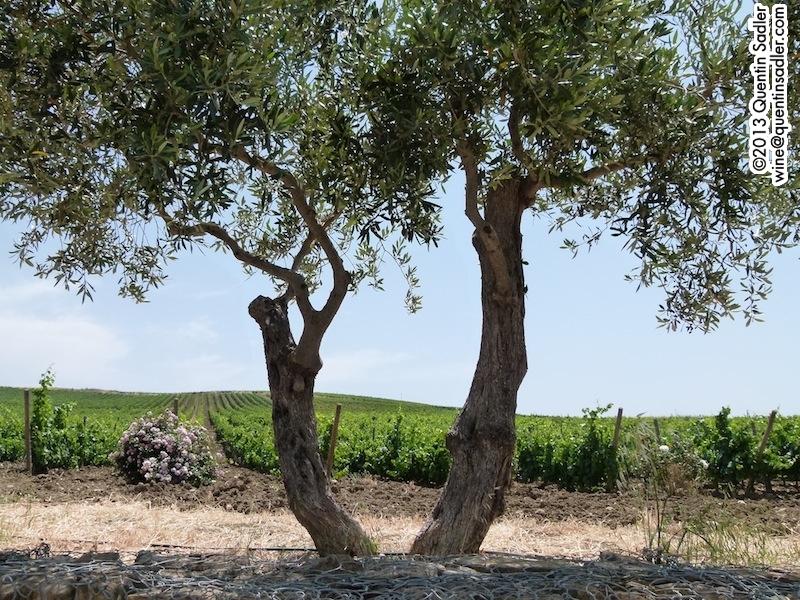 This impressive producer started making wine much further West in Sambuca di Sicilia and Menfi, but now has vineyards dotted throughout the island. 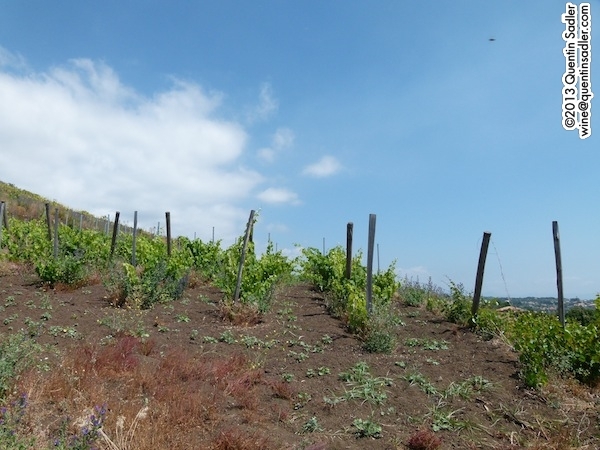 They created an estate on Etna in 2008 and their first vintage is the 2012. So far they only make a white that it is mainly Carricante blended with something quite surprising – and wow is it good. More of that another time. 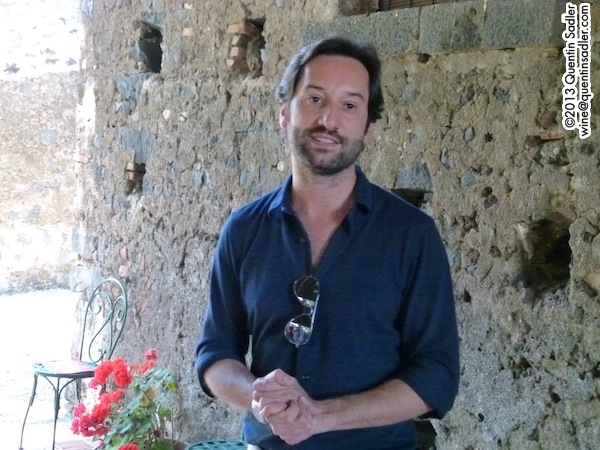 In the meantime, do try some wines from Etna – you will enjoy them, I promise. 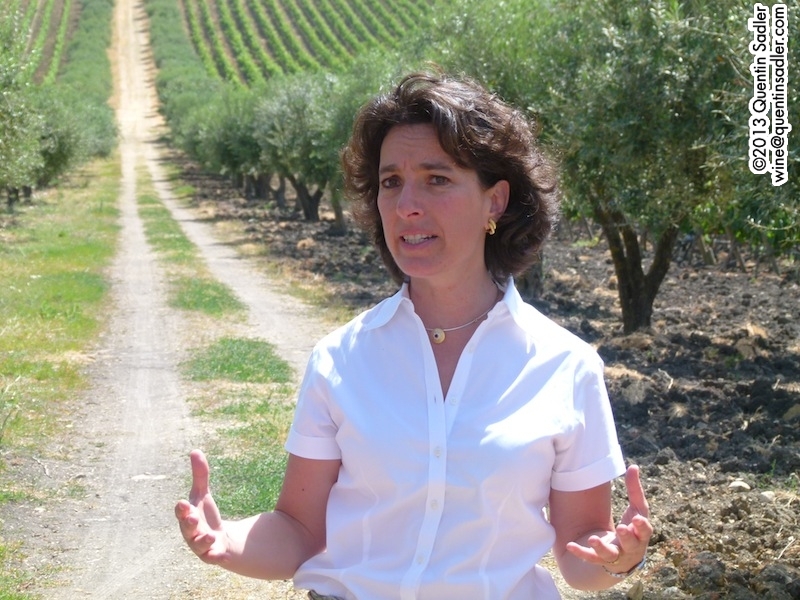 Recently I enjoyed an amazing tour of wine regions and producers in Sicily. I had never been before and was very excited to see this wonderful island. It is a beautiful place that really provides a feast for the senses, the landscape is stunning, the food a revelation and the wines were generally very impressive indeed. 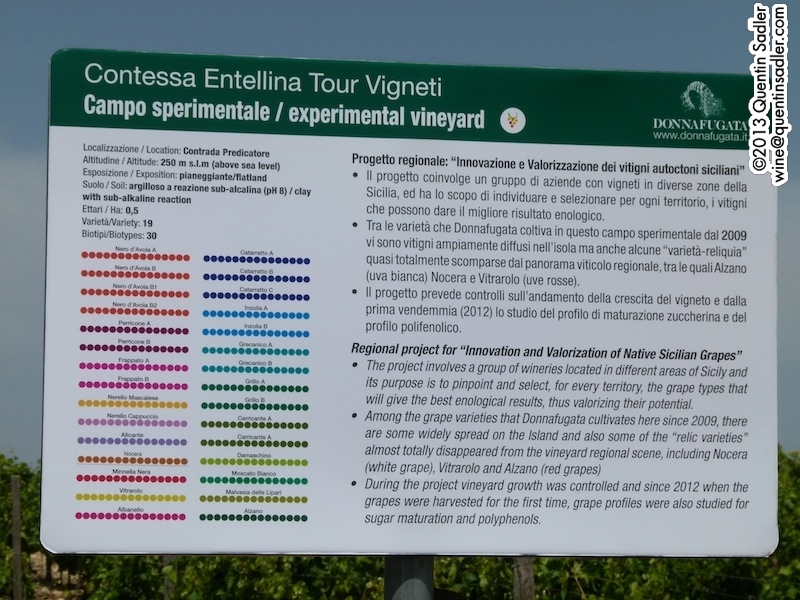 Along with visits to the great estates of Benanti, Planeta and Tasca d’Almerita, seeing the Donnafugata estate was a real highlight. Like all good winery visits – and indeed wines – it started in the vineyards. Standing in Donnafugata’s Contessa Entellina estate near Sambuca di Sicilia I was taken aback by the sheer beauty of the place. I had never been to Sicily before and every time we de-bussed I was thrilled by the variety and vitality of the landscape. The wild flowers in particular – fields of scarlet poppies intermingled with vibrant yellow, purple, pink and blue flowers were everywhere – made my heart sing. So, here I was at Donnafugata, a winery I only knew about vaguely and even then mainly because of their lovely labels. I was greeted by the lively and animated José Rallo – I found it really hard to take good photographs of Sicilian winemakers as they never seem to keep their hands still. José is the daughter of Giacomo and Gabriella Rallo whose family have produced Marsala for over 150 years and who created the Donnafugata estate to produce premium still wines in 1983. The wonderful name by the way means ‘fugitive woman’ or ‘woman in flight’ and refers to Maria Carolina, sister of Maria-Antoinette and Queen of Naples and Sicily. In 1799 she fled the invading Republican French troops – under General Napoleon Bonaparte – and found refuge in the country estates of a noble. 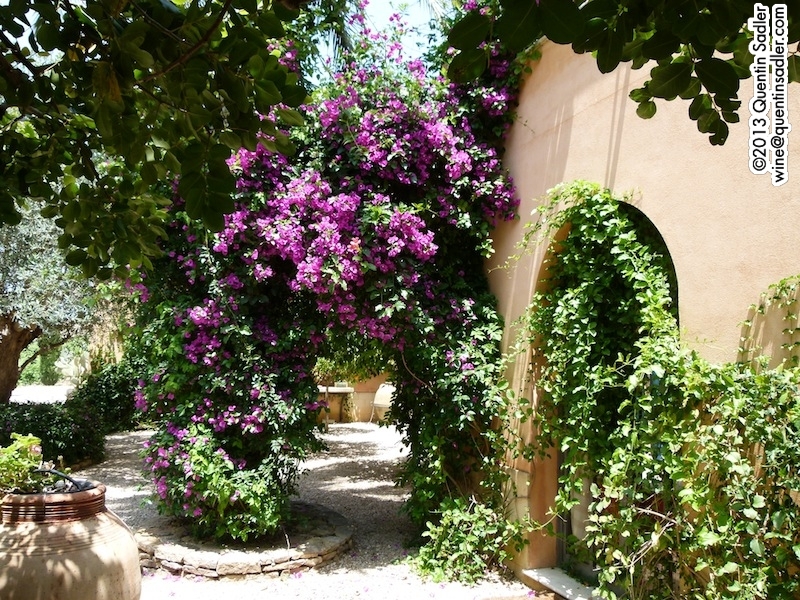 These same estates are now home to the Rallo’s vineyards and in Di Lampedusa’s great novel, The Leopard, he christened them Donnafugata and the name was adopted by the Rallos as an evocative name for their new winery. 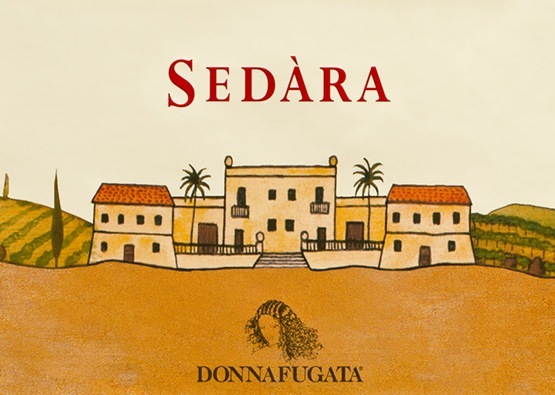 Donnafugata appears to be one of those wineries – as all the best ones are – that never stands still, but continually evolves. Originally Marsala producers, they then became trailblazers of fine Sicilian wines made from international grape varieties, before becoming champions of indigenous Sicilian grapes and creating an experimental project, with other growers, to pinpoint the perfect site for each grape variety to thrive in Sicily. One of the experimental vineyards. 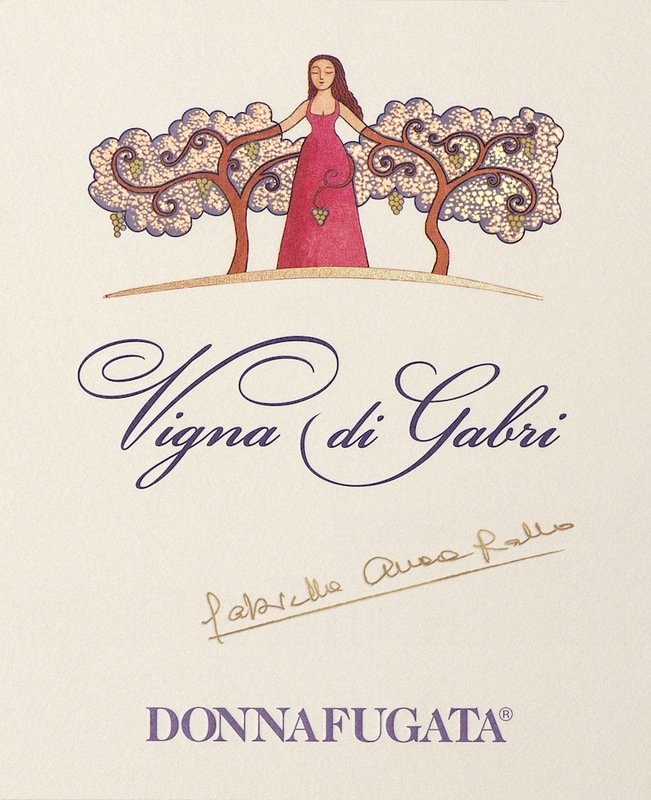 This single vineyard wine – Vigna di Gabri in Contessa Entellina – is a blend of Ansonica, the Marsala grape, with some Chardonnay, Viognier, Sauvignon Blanc and Catarratto. 85% of the wine was fermented in stainless steel vats, while 15% was fermented in second use French oak barrels. The 2002 was wonderfully deep and rich with pithy citrus, wild flowers and pine nut notes, while the dry palate offered dry honey, herbs, a waxy texture, citric acidity and touch of saltiness on the long sapid finish. I liked this together with the fresher, more creamy, less waxy 2011 as well. This wine and vineyard is named in honour of José’s mother Gabriella Rallo who created it and whose signature graces every bottle. 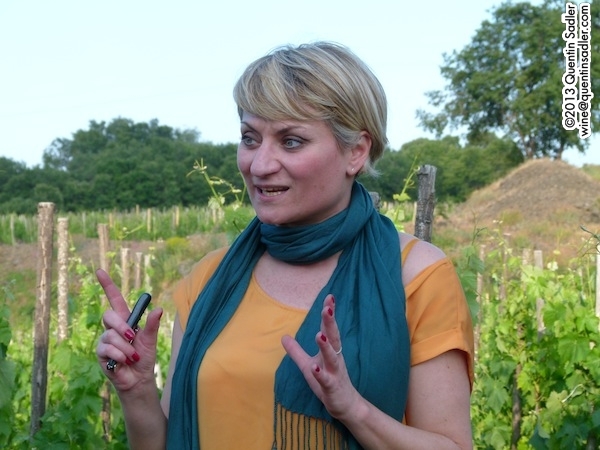 Apparently Gabriellas believe that Ansonica is capable of producing quality table wines as well as Marsala and so she created this vineyard and set out to prove her point with this wine. José seems very proud of her mother, especially that she ‘was the first woman in Sicily to put on boots and supervise her workers in the field’. 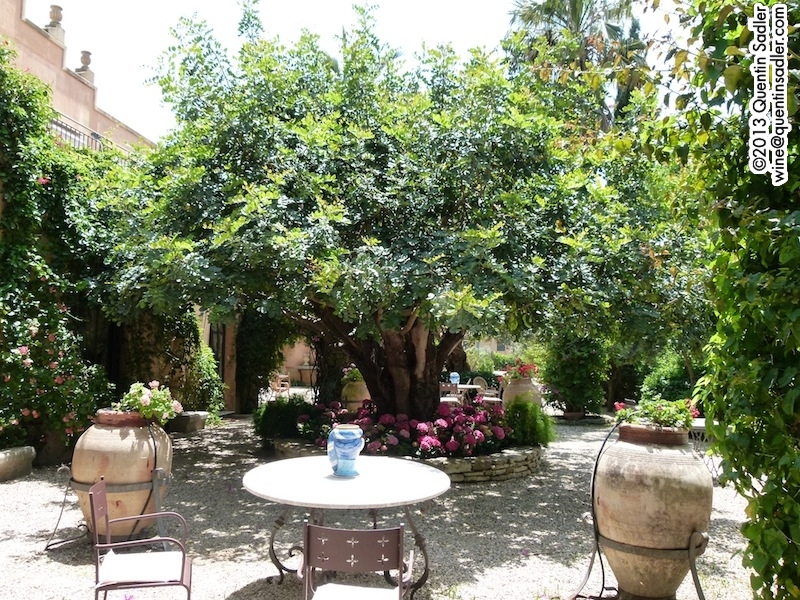 It is clear that Gabriella has green fingers for things other than vines too, as the gardens she created around the winery and family house are stunningly beautiful and peaceful. This Chardonnay and Pinot Noir blend was my favourite Sicilian sparkling wine of the whole trip and interestingly the grapes are purposely grown on high north-east facing slopes which protect the grapes from the sun and so preserve the grape’s acids. It was nicely balanced with good fruit and acidity as well as complexity from 28 months ageing on the lees. For me though the wine highlight of this visit was the sweet Zibibbo wines of Pantelleria. I have long been fascinated by this volcanic island that – though politically a part of Sicily – is nearer to Tunisia than Italy.The main grape here of course is Moscato or Muscat of Alexandria, but they traditionally call it Zibibbo in these parts as it came here via North Africa and apparently zibibb means dried grapes in Arabic. 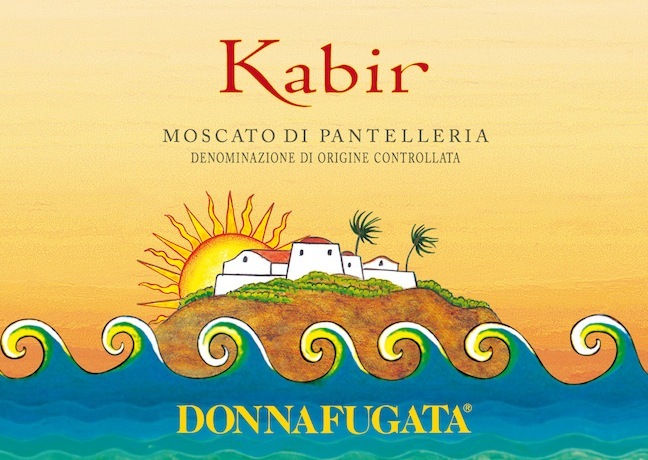 Donnafugata Kabir D.O.C. Moscato di Pantelleria is an aromatic and attractive Moscato with a light, fresh character – there is even a little touch of frizzante to it – and I enjoyed the 2011 vintage of this wine as well as its lovely label. 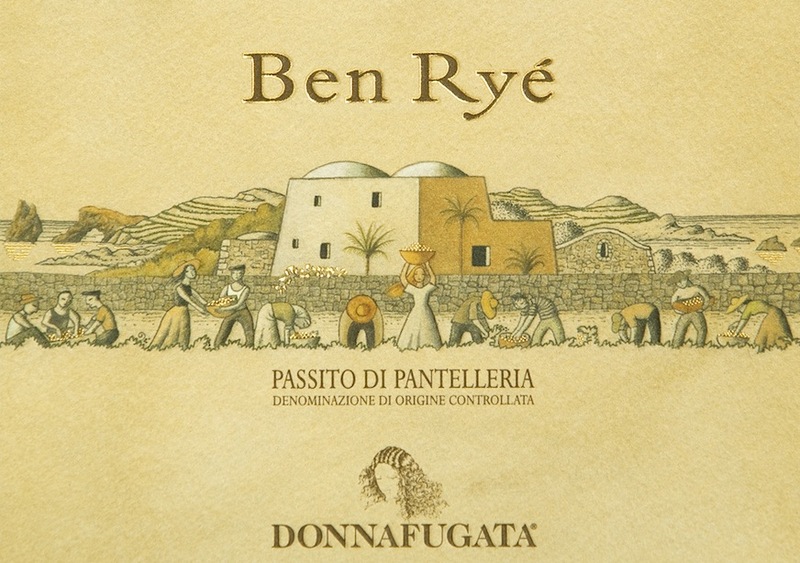 Altogether more serious, more complex and hedonistic – but no less pleasurable – is the amazingly concentrated Donnafugata Ben Ryé D.O.C. Passito di Pantelleria. This extraordinary wine is made from grapes that are harvested in August and dried in the sun for 3-4 weeks. Then in September they pick another load of fresh, but very ripe grapes and start a normal fermentation. At this point they de-stem the dried grapes by hand and add them in batches to the fermenting fresh Moscato so that they impart their deeper flavours, higher sugars and great complexity. The fermentation finally stops around the end of November and the wine is then aged in bottle. I was instantly seduced by the complexity and stunning figgy and salty caramel richness of the 2004, while the orangey panforte-like 2006 was very nearly as complex – give it time. The 2010 was altogether fresher and more straightforward, but still delicious and I am sure will age to be just as memorable as its older siblings. 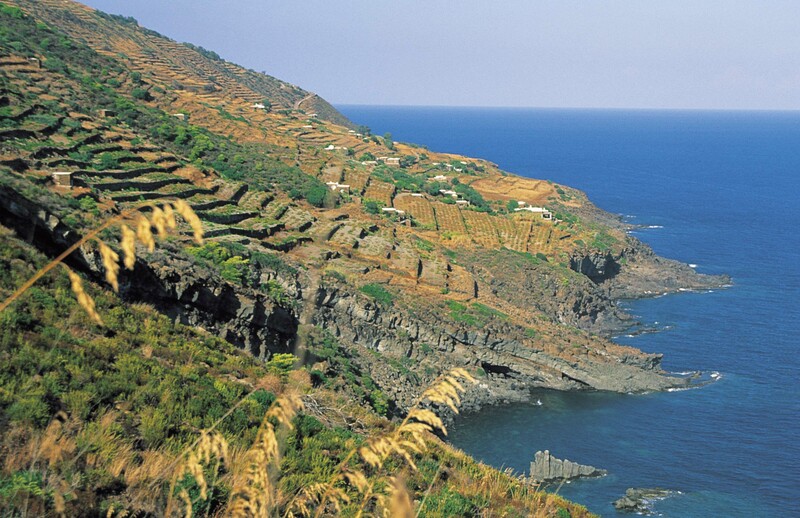 Sadly I have yet to visit Pantelleria, but it seems to be a place of heroic viticulture like Santorini, Cinque Terre, Ribera Sacra and Ischia. It must be back breaking work tending these low lying 100 year old bush vines, harvesting them by hand, drying them in the sun, harvesting another lot and then fermenting them for the best part of 3 months, but it all seems to be worth it. After a wonderful lunch José sang for us, serenading my friend Keith Grainger with ‘An Older Man is Like an Elegant Wine’ – the day after his birthday too, so I cannot decide if that was apt or just rubbing it in. José is a fine singer who has recorded 2 CDs pairing wines with a mixture of Jazz standards, Brazilian and Sicilian songs and she gave us each a copy of her second CD as a gift. José serenading the ever elegant Keith. Happily José had paired my favourite track on the album – her version of Rita Lee’s Agora Só Falta Você with my favourite dry Donnafugata wine, the Vigna di Gabri – I like them both in isolation and will have to try them together sometime to see if fusion works for me. The whole visit was a great experience and a privilege to get an insight into this beautiful estate and to witness at first hand the passion and love they have for their land and what they do. Donnafugata wines are available in the UK through Liberty Wines. 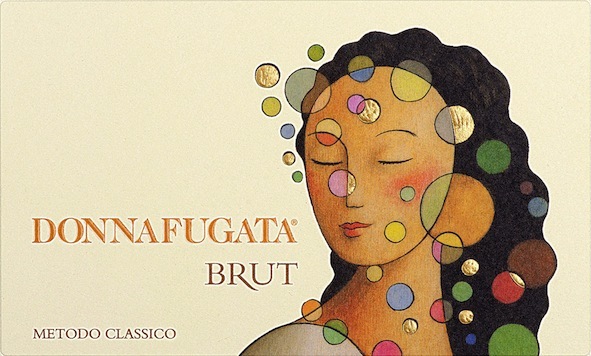 Donnafugata wines are available in the US through Folio Fine Wine Partners. Donnafugata wines are available in Australia through Arquilla.